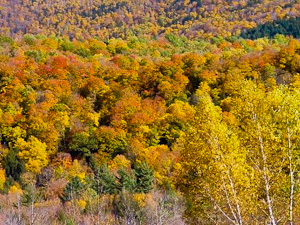 Each fall people set out on drives with the purpose of “leaf watching”; that is, they take leisurely drives to check out the scenery as the foliage transforms from green to yellow, orange and finally red. 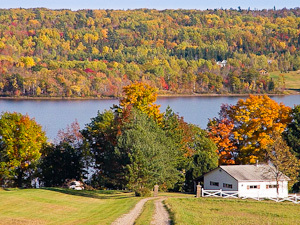 For years, New England has been one of the most popular destinations for this activity. 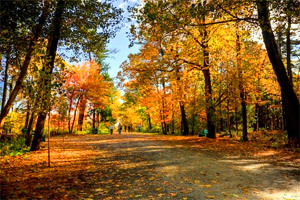 Thousands of people—ranging from couples to families to motor coach groups—flock to New England each year to view fall foliage throughout the region. A lesser known, but arguably more phenomenal, region to observe the fall foliage transformation is along the shores of the Bay of Fundy. Home of the world’s highest tides—up to 54ft at the head of the Bay—Fundy is situated between the Provinces of New Brunswick and Nova Scotia. Scenic routes in both provinces guide travelers along winding, coastal roads. In addition to breathtaking scenery, visitors will enjoy an abundance of historical, cultural and natural attractions as they explore New Brunswick’s Fundy Coastal Drive and Nova Scotia’s Glooscap and Evangeline Trails. Having said this, there are five specific reasons to choose Fundy as your fall foliage destination over New England. Keep reading and you will quickly agree that Fundy’s shores are the ideal getaway for leaf watchers! While traveling along the Fundy coast explore the untamed, natural beauty of the many national and provincial parks that line the Bay’s shores. In New Brunswick hike through peat bogs to discover interesting flora or stroll along the pristine sand beach at New River Beach Provincial Park, hike, bike, walk or drive along over 10 miles of coastal wilderness known as the Fundy Trail Parkway and explore the highlands of Fundy National Park to find interesting rock formations and diverse ecosystems. Across the Bay, in Nova Scotia, spend time beachcombing and rock hounding in Five Islands Provincial Park, hike along 18 miles of unspoiled coastline below 600-foot towering seacliffs at Cape Chignecto Provincial Park, hear the hollow roar caused by turbulent waters surging over the submarine ridges at Cape Split and appreciate spectacular scenery and an abundance of wildlife in Blomidon Provincial Park. Breathtaking year round, the magnificent colors of fall take the scenery in these parks to a whole new level. No where in the world can you see whales like in the Bay of Fundy. 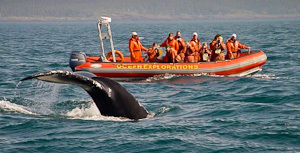 Sailing yachts, catamarans, zodiacs and converted fishing boats take thousands of passengers out on the Bay of Fundy each year in search of whales, porpoises and other marine life. The North Atlantic Right whale is one of the most endangered whale species, with only an estimated 350 remaining. Each year between late August and early October, coinciding with the peak fall foliage period, Fundy hosts a large portion of this population as they stop to feed in the Bay’s tidal waters en route to their winter homes off the coast of Florida and Georgia. Seeing these magnificent, rare mammals swimming, feeding and perhaps even breaching alongside your vessel of choice is certainly something you will remember for years to come. 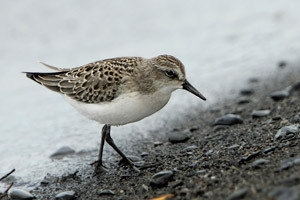 Over 360 species of birds have been spotted throughout the Bay of Fundy region, including such endangered species as the peregrine falcon, the piping plover and the semipalmated sandpiper. The Bay of Fundy is a preferred destination for many birdwatchers, particularly during migration season, due to its prime location along the Atlantic Flyway. Of the two million birds that travel along the Atlantic Flyway each year, three-quarters stop in the Fundy region, making it the most important stopping point along the Eastern seaboard. While peak viewing is generally between mid-July and mid-August, migratory stops in the Fundy region continue through September and October. Maritimers are renowned for their warm, welcoming hospitality. While traveling along the Fundy coast, whether in rural communities, charming towns or the city, you will meet many friendly people with interesting anecdotes to share. Finally, an additional bonus of “leaf watching” along the Fundy shores is the lack of crowds. Unlike fall foliage tours throughout New England, brilliant Fundy foliage has been a long-kept secret. Compared to those surrounding larger New England cities, such as Boston and Providence, the highways that join Fundy cities and towns are practically deserted allowing you to sit back and discover the joy of scenic driving. So come to the Bay of Fundy to witness the ebb and flow of the highest tides in the world while enjoying spectacular scenery enhanced by leaves at all stages of transformation. Gorgeous greens, golden yellows, vibrant oranges and fiery reds against the contrasting blue tidal waters. Less than eight hours from Boston, and only three hours from Bangor, choose the Bay of Fundy as your fall foliage destination! As a recent transplant to the area, i am eagerly anticipating my second autumn season here in the Maritimes! Last year was excellent and a far cry from Florida, where I relocated here from a year ago. I especially agree with #2 — the hospitality and warm welcome offered in The Maritimes is incomparable! Please tell me when the fall colors will be at their peak this year. Hi Suzanne, the exact timing is different every year and it largely depends on the weather conditions of the Fall, since the change in temperature in the Fall is what makes the leafs change colour. 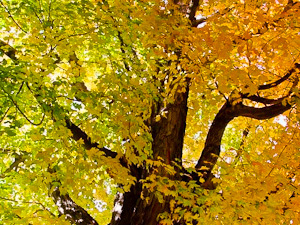 Typically the Fall colours start to appear in late September and are their best the first two weeks of Canada’s Thanksgiving Weekend (middle of October). New Brunswick is a great place to see the leafs. Some great places close to urban areas are the St. John River Valley and the Miramichi River Route. I personally also really like to go see the fall colours close to the ocean. The Fundy Trail and both national parks (Fundy and Kouchibouguac) are fantastic spots. 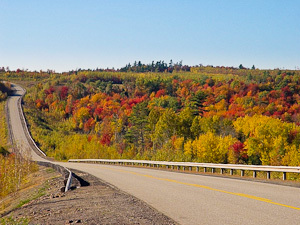 Last year you were able to keep an eye on the leaf colouring progress here: http://www.tourismnewbrunswick.ca/Learn/WeatherAndSeasons/Fall/AutumnFoliage.aspx (I am not sure if they’ll start updating this page again this year).